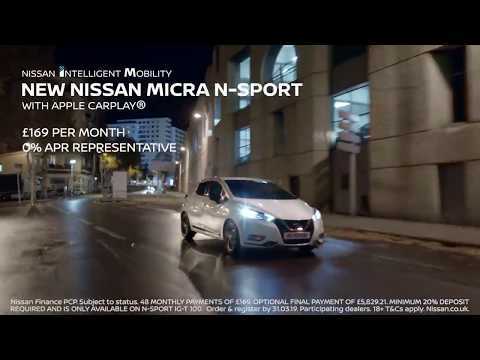 Energising and agile, the new premium Nissan Micra N-Sport is designed to be dynamic and fun to drive. From the carbon-look 17” alloys and mirror caps to the exclusive N-Sport badge and glossy black bumpers/side mouldings, N-Sport is guaranteed to turn heads. High-spec materials, sporty design touches and dynamic accents make the Micra N-Sport as exciting on the inside as it is on the outside. Sporty shock-proof kneepads and dynamic black trim enhance the Micra N-Sport's athletic credentials, while leather/alcantara seats* guarantee premium comfort. Solid White, Passion Red, Enigma Black or Echo Grey. Terms & Conditions: Terms and Conditions: ** Finance Offer valid until 30th June 2019 and subject to vehicle availability. Finance provided by Nissan Finance, PO Box 149, Watford WD17 1FJ. Subject to status. Guarantees and indemnities may be required. You must be at least 18 and a UK resident. Terms and conditions apply. Offer based on millage restrictions and excess mileage charged per mile. Offers not available in conjunction with any schemes or other offers. Vehicle price includes first registration fee and 12 months’ road fund licence. Terms and Conditions apply. Representative example is based on a total mileage of 6,000 per annum.